The Maxspect XF350 Gyre Flow Pump w/ Controller and XF330 Gyre Flow Pump w/ Controller are the pinnacle of pump design, performance and control. This third generation version incorporates all of the amazing features of the original Gyre pumps and improves on them. You can add a second Maxspect XF350 Gyre Flow Pump Only or a second Maxspect XF330 Gyre Flow Pump Only and have the two Gyres controlled with the same Controller. The AquaTop CF300MKII, CF400UVMKII & CF500UVMKII Canister Filters features Vortex Prime. Vortex Prime is a manual way to prime the filter if the included priming pump does not do the job. Basically, Vortex Prime is an inlet you pour water into to prime the pump. This eliminates the need for manual siphoning! Say good bye to a mouth full of aquarium water!!! The CF400UVMKII & CF500UVMKII include a built-in 9W UV sterilizer that will help kill algae spores and bacteria, promoting crystal clear water. 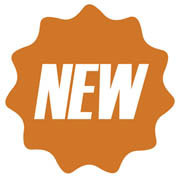 Over the past couple years we've added hundreds of product packages to our web site. These packages combine products that work well together to achieve a particular goal with your aquarium. 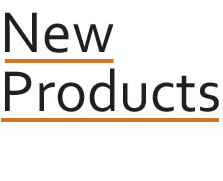 Quite often aquarium products require accompanying products to function, and we're doing our best to eliminate the guesswork when buying those products. Some of the latest offerings are Two Little Fishies Phosban Reactor Packages. For the Reactor 150 we have the Two Little Fishies Phosban Reactor 150 Phosban Package and the Two Little Fishies Phosban Reactor 150 Carbon Package. These media reactor packages combine the Phosban Reactor with either the Phosban or carbon media, an appropriate pump and black vinyl hose in order to achieve either an elimination of phosphate or to provide chemical filtration with carbon. 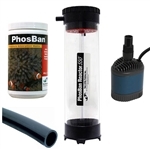 For larger tanks we have the Two Little Fishies Phosban Reactor 550 Phosban Package and the Two Little Fishies Phosban Reactor 550 Carbon Package. The Marineland Fully Adjustable Essential and Advanced LED Lights are the latest offering from Marineland. These lights feature replaceable LEDs PODs, with ten different colors to choose. Place the PODs wherever you want on the light tracks. Timer option available. For lower wattage needs get the single track Essential LED Lights and for higher wattage needs get the double track Advanced LED Lights. The Kessil A360X Tuna Blue and the Kessil A360X Tuna Sun take LED lighting to a new level. These lights are 25% brighter than the older A360 lights, but the lights are smaller and have a lower profile. When used with the Kessil Spectral Controller X they have improved color control, independent control of lights sets and smoother color and dimming transitions. The OASE FiltoSmart Canister Filters are perfect for small marine and freshwater aquariums. The FiltoSmarts have a compact design with a large filter surface. 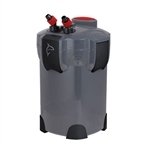 For larger aquariums OASE has the BioMaster, which features an easy to clean prefilter module that can be removed and cleaned without disassembling the entire filter. The BioMaster Thermo Canister Filters come with OASE HeatUp heaters installed inside. The ProFlex Modular Sumps are manufactured using extremely durable materials. The flexibility of each units allow for multiple types of setups. You can use the middle chamber as a refugium or for your protein skimmer. Four sizes to choose from. We also have some packages that include plumbing fittings, hose and return pumps. The Lifegard Aquatics Cystal Aquariums feature 45° edges and ultra-clear low-iron glass. The glue joints are invisible. Crystal tanks are rimless and made of ultra-low iron glass which allows the viewer an undisturbed viewing of their underwater masterpiece. Includes a back filtration compartment with return pump and filtration media. Three sizes to choose from. Python's Multi-Purpose Water Conditioner, Multi-Purpose Bio-Support and Multi-Purpose Bio-Clean are all part of the three step Python water treatment system. Available in 1 oz, 4 oz & 16.2 oz sizes. We carry the Aqueon 7.5 Gallon Gallon LED Shrimp Aquarium Kit and the Aqueon 8.75 Gallon Designer LED Shrimp Aquarium Kit. Includes LED light, filter, substrate, water conditioner and setup guide. 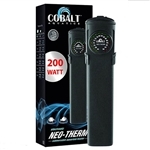 The Cobalt Aquatics Neo-Therm Aquarium Heaters are fully submersible electronic heaters that features a modern, super flat design with an easy to set "one touch" control system. 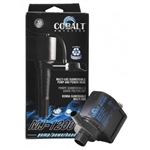 The Cobalt Aquatics Mini-Therm compact and fully submersible heaters feature a constant ON design, specifically for small aquariums. These are the same pumps as the old style Aquarium Systems Maxi-Jet Powerheads made in Italy. They are built to perform and last under the harshest conditions. Ideal for wave makers, protein skimmers, calcium reactors, nano aquariums, under gravel filters and hydroponic applications. Six sizes to choose from. The AquaticLife WiFi Reno LED Lighting Fixtures are a great choice for fish-only tanks. These slim, low-profile fixtures have expandable legs that extend the fixture an extra 3.5 inches (total). There are versions with WiFi and versions that do not use WiFi. 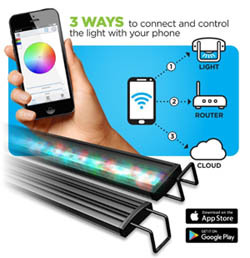 The WiFi Reno lights can be controlled with your smart phone. 20", 24", 30", 36" & 48" versions. The BiOrb Cube Aquariums are the latest BiOrb offerings. They come in 30 liter and 60 liter sizes. Three colors to choose from. 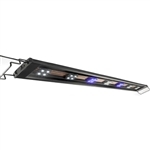 Buy with multi-colored remote light or the standard LED light. 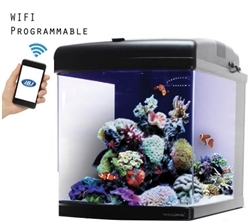 The JBJ 28 Gallon Nano Cube WiFi LED Aquarium is the latest Nano Cube offering, and it's the first Nano Cube to offer WiFi lighting control. The LED lights can be controlled with a smart phone or with the two modes on the LED canopy: Manual Mode or Smart Mode. With the Manual Mode you can remotely control the lights in real time. The Smart Mode allows you to customize the lighting cycles with the built-in timer on 10 different points. It’s incredibly user-friendly to have these two modes so that owners can adjust their lights on the fly with or without their phones. Beyond the WiFi LED lights, the JBJ 28 Gallon Nano Cube Aquarium w/ LED Lighting has all the same features necessary for a successful reef aquarium. There is ample water flow, a simple filter and water columns in the rear for heaters, refugiums and protein skimmers (heater, protein skimmer & refugium not included). Includes stand. 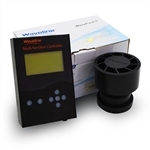 The Waveline WavePuck II DC Controllable Pump is a fully controllable flow pump that moves up to 3000 gph and consumes no more than 30 watts of power in the process. The broad flow water movement will encourage coral growth instead of blasting it away with harmful "hot spots" associated with other wave pumps. It can link up to most 3rd party controllers by using an available 0-10 volt port. Compatible with most system controllers including the APEX by Neptune Systems and the Reef Angel among others. The controller allows you to create pulsing or surge effects with its easy to set waveline mode as well as the expected feed mode. Simply set your desired max power/flow setting and its on and off power cycles. You can also set the pump run time to facilitate night mode by shutting the pump down until the run time resumes. 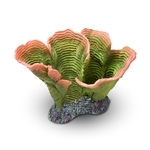 Aquatop’s vibrant reef decorations have a natural look and feel. These life-like ornaments are made from a non-toxic fish-safe polyresin that won’t discolor your aquarium water or affect your water parameters. 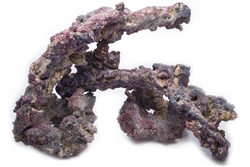 They can be used as an alternative to live corals and other livestock in a saltwater aquarium application. The decorations include colorful coral as well as jellyfish, clams, starfish and more. 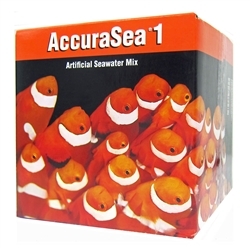 The Two Little Fishies AccuraSea1 Artificial Saltwater Mix is formulated to simulate natural seawater. It's packaged in ten precisely weighed packages. The advantage of this is you can mix up a batch without ever having to check the salinity. No more back and forth adding salt, mixing, waiting, testing and adjusting until you get it right. Simply put a measured volume of water in the mixing bucket, and add the contents of one or more packs (depending on the volume of water). Contains 10 little packets that each make 4.5 gallons (s.g. of 1.026 at 77F), 5 gallons (1.023), or 5.5 gallons (1.021) of saltwater. At 1.026 the formula has an alkalinity of 8 dKH, magnesium 1300 mg/l and calcium 420 mg/l. 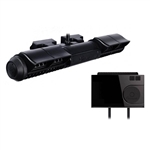 The Hydor Aqamai LRM-LED WiFi 100W Reef Light, Black, is a professional reef aquarium lighting system programmed through WiFi (using the Aqamai App with an Android or Apple iOS device). The Aqamai app can control all your Aqamai smart devices directly from your smart phone or tablet (such as the Hydor Aqamai KPS Wi-Fi Controllable Wavemaker Pump). 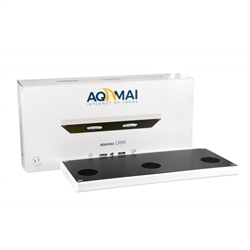 At Less than 0.80 inches thick, the Aqamai LRM LED Reef Light is the most compact high-powered LED light on the market. Dimensions: Length 14.1" X Width 6.3" X Thickness .78". 100 watts. 2 clusters of 15 LEDs. CaribSea LifeRock Shapes is made of an aragonitic base rock, instead of the typical cement used by some other artificial rock creators. Every rock contains a network of micro and macro pores that intertwine within the rock's internal structure, creating the perfect environment for natural nitrifying bacteria. LifeRock is manmade. Every LifeRock from CaribSea has an artificial coating and texture that mimics natural coralline algae after being in the ocean for years. 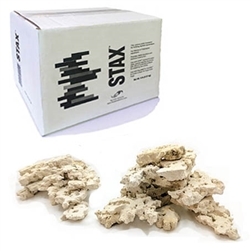 Two Little Fishies STAX Rock is a flat, porous oolitic limestone for building layered aquascapes in marine aquariums. It provides a stable structure and will not introduce pets into your aquatic environment. Use with Two Little Fishies STIX Cement to make open, gravity defying structures with lots of horizontal surfaces for attaching live corals. Use with Two Little Fishies AquaStik or Two Little Fishies CorAffix to create a base for large coral frags. Each box weighs 20 pounds. Pieces vary from box to box. Most of the pieces range in size anywhere from 3" x 4" to 4" x 6". The Tunze Protein Skimmers come in a wide variety of styles. 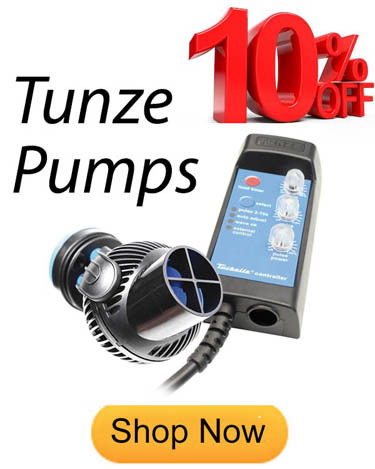 The Tunze Comline DOC Skimmers come with AC pumps. The Tunze DOC Skimmers come with controllers and DC pumps. The smaller sizes are designed to fit inside an aquarium (ideally a back compartment), and the bigger ones are in sump skimmers. The Tunze Turbelle Nanostream Pumps are relatively compact, high powered and energy efficient. All models come with magnet holders and the larger versions come with a controller. The Tunze Stream Pumps are also high powered and energy efficient, but have a largely footprint. 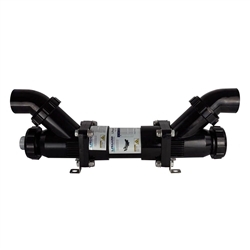 The Rossmont Riser R850 Return Pump can be used with the Rossmont Waver Wireless 2-Channel Controller. 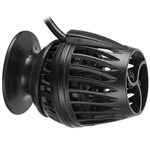 With the Waver the Riser flow can be increased and decreased, and up to 2 Risers can be controlled with the Waver for a wave effect. Without the Waver the Riser is still a powerful, quiet & energy efficient pump. 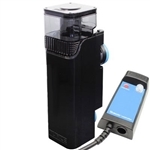 With the Waver the flow rates range from 210-850 gph and power consumption from 13.5-55 watts. 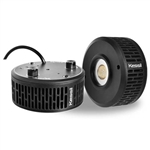 The Riser R850 can be used as a circulation pump, placed either in the sump or under the aquarium in a closed-loop system. In some instances it can be placed in filtration chambers at the back of an aquarium (see dimensions below). The Hydor Aqamai KPS Wi-Fi Controllable Wavemaker Pump has improved on the Hydor Koralia by adding wi-fi wavemaking controllability. 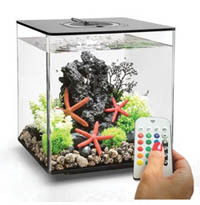 Customize aquarium water movement anywhere in the world from the convenience of your Android or iOS smart device. Simply install the Aqamai pump, download the Aqamai app, and experience fully programmable wi-fi control of your pump. Schedule and customize flow rate, adjust flow interval, and choose from six different water flow modes including: Constant Flow, Wave, Smooth, Random, Feed, and Night modes.